How would I recognise that my child does not see well? Defective vision in children often remains unnoticed, as it is very costly to detect it. For instance, it can be the case that children with poor eyesight do not achieve well at school, simply because they cannot see the letters on the board clearly enough. As children are clearly not as good as adults at expressing themselves, we recommend a medical check-up with an ophthalmologist in such cases. Indicators of problems with vision are, for example, frequent rubbing of the eyes, blinking or if the child holds a book very close to their eyes. Eyesight problems in children that remain undiscovered can lead to life-long defective vision. Consequently, it is recommended that any weaknesses in vision be corrected whilst still a child, so that the eyes can learn to focus properly. 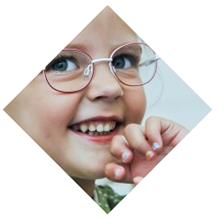 Trivex® and polycarbonate are especially suitable materials for children’s spectacle lenses, as they are very resistant to breakage. As they play, children need extremely robust, yet flexible spectacle lens materials, as they are much harder on their glasses than adults. Also recommended is a hard coating to prevent scratching, therefore guaranteeing the lenses will last much longer. Just as important is a spectacle frame that is suitable for children. It should be capable of being fitted properly to the nose and ears, so that the child can move around freely when wearing it. Many opticians offer special products for children’s spectacles, so it is best to seek the advice of a specialist. 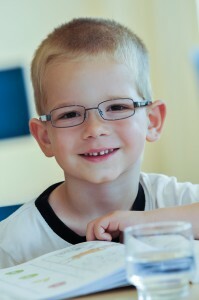 Is an anti-reflective coating a good idea in the case of children’s spectacles? Yes, anti-reflective coatings reduce troublesome reflections. Such reflections are particularly annoying in artificial light (at school, for instance). The spectacle wearer enjoys relaxed, clear vision. 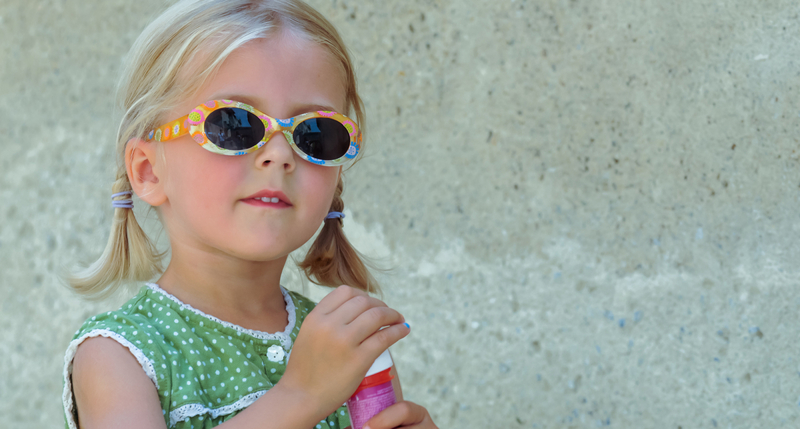 An anti-reflective coating is also advantageous for those looking at the child. How can you protect spectacle lenses from scratching? Plastic lenses have a longer service life if they are given a hard coating. The hard coating consists of a special lacquer that is applied to the front and rear surfaces of the spectacle lens. What is most suitable for children’s spectacles? Glass or plastic? Plastic is more robust than glass, not to mention being lighter in weight. We therefore recommend for children’s spectacles and for protection of the eyes: plastic lenses (please see above). How would I recognise that my small child does not see well? The early detection of weaknesses in vision is especially important in the case of children. The eyesight is fully developed by about seven years old. If a problem with the eyesight is corrected before this age, the chances of a successful improvement are far greater than later in life. If a baby squints or rubs its eyes often, cannot keep its eyes on an object and follow it around or grasp it, this can be an indicator that the child has a visual weakness. In the case of older children and those of school age, watching the television too closely or being a very short distance from a drawing or book can also be indicators. In each of these cases, a basic eye test is recommended in order to clear up any visual weakness.